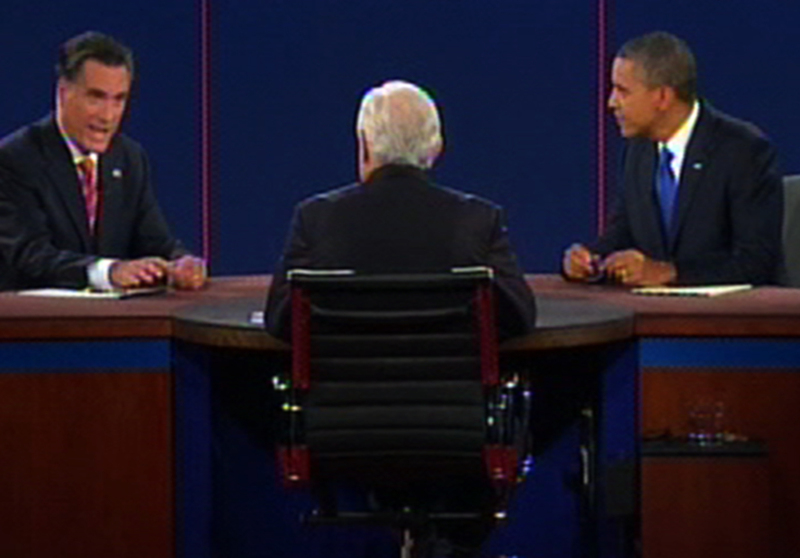 President Obama and Mitt Romney met for the third and final debate Monday night, where they tackled foreign policy issues. Below, CBSNews.com takes a closer look at the candidates' assertions on issues relating to Iraq, Russia, Iran, the size of the military, the economy and energy. "You say that you're not interested in duplicating what happened in Iraq. But just a few weeks ago, you said you think we should have more troops in Iraq right now..."
ROMNEY: "Well, of course I don't concur with what the president said about my own record and the things that I've said. They don't happen to be accurate... First of all, Russia, I indicated, is a geopolitical foe... It's a geopolitical foe, and I said in the same -- in the same paragraph I said, and Iran is the greatest national security threat we face. Russia does continue to battle us in the U.N. time and time again. I have clear eyes on this. I'm not going to wear rose-colored glasses when it comes to Russia, or Mr. Putin. And I'm certainly not going to say to him, I'll give you more flexibility after the election. After the election, he'll get more backbone. Number two, with regards to Iraq, you and I agreed, I believe, that there should be a status of forces agreement." ROMNEY: ... In the new START treaty, as well as [Obama's] decision to withdraw missile defense sites from - from Poland and then reduce our missile defense sites in Alaska from the original plan, I mean these are very unfortunate developments. And if he's planning on doing more and suggests to Russia that - that he has things he's willing to do with them, he's not willing to tell the American people - this is to Russia, this is, without question, our number one geopolitical foe. They - they fight every cause for the world's worst actors. The I - the idea that he has some more flexibility in mind for Russia is very, very troubling, indeed. BLITZER: But you think Russia is a bigger foe right now than, let's say, Iran or China or North Korea? Is that - is that what you're suggesting, Governor? ROMNEY: Well, I'm saying in terms of a geopolitical opponent, the nation that lines up with the world's worst actors. Of course, the greatest threat that the world faces is a nuclear Iran. A nuclear North Korea is already troubling enough. As for Romney's remarks on Iraq, he did reference in a speech this month at the Virginia Military Institute the Obama administration's failed attempts to reach a deal with the Iraqi government to keep some U.S. troops there. Romney said in that speech, "In Iraq the costly gains made by our troops are being eroded by rising violence, a resurgent al Qaeda, the weakening of democracy in Baghdad and the rising influence of Iran. And yet America's ability to influence events for the better in Iraq has been undermined by the abrupt withdrawal of our entire troop presence. The president's tried, he tried, but he also failed to secure a responsible and gradual drawdown that would have better secured our gains." ROMNEY: "Our Navy is smaller now than at any time since 1917. The Navy said they needed 313 ships to carry out their mission. We're now at under 285. We're headed down to the low 200s if we go through a sequestration. That's unacceptable to me. I want to make sure that we have the ships that are required by our Navy. Our Air Force is older and smaller than at any time since it was founded in 1947. "We've changed for the first time since FDR -- since FDR we had the -- we've always had the strategy of saying we could fight in two conflicts at once. Now we're changing to one conflict. Look, this, in my view, is the highest responsibility of the President of the United States, which is to maintain the safety of the American people. "And I will not cut our military budget by a trillion dollars, which is a combination of the budget cuts the president has, as well as the sequestration cuts. That, in my view, is making -- is making our future less certain and less secure." OBAMA: "Bob, I just need to comment on this. First of all, the sequester is not something that I've proposed. It is something that Congress has proposed. It will not happen. The budget that we are talking about is not reducing our military spending. It is maintaining it. But I think Governor Romney maybe hasn't spent enough time looking at how our military works. "You mentioned the Navy, for example, and that we have fewer ships than we did in 1916. Well, Governor, we also have fewer horses and bayonets, because the nature of our military's changed. We have these things called aircraft carriers, where planes land on them. We have these ships that go underwater, nuclear submarines. "And so the question is not a game of Battleship, where we're counting ships. It's what are our capabilities. And so when I sit down with the Secretary of the Navy and the Joint Chiefs of Staff, we determine how are we going to be best able to meet all of our defense needs in a way that also keeps faith with our troops, that also makes sure that our veterans have the kind of support that they need when they come home. And that is not reflected in the kind of budget that you're putting forward because it just doesn't work." Data from the U.S. Navy shows that in 2011, the Navy had 285 ships -- the fewest number of ships since 1916, when it had 245. In 1917, it had 342 ships. The number of ships reached a low point in 2007, at 278. The Navy had said since 2005, as Romney stated, that it needed 313 ships to meet global defense needs. However, in April of this year, Navy Secretary Ray Mabus said the Navy could meet its needs with a 300-ship fleet. Mabus in April also responded to Romney's critique of the Navy's relatively small fleet -- like Mr. Obama, he said the comparison was pointless because of today's advanced technology. "It's like comparing the telegraph to the smartphone. They're just not comparable," he said, the Navy Times reported. As for the assertion that the U.S. Air Force is older and smaller than at any time since 1947, Politifact finds the closest answer in a report published in 2010 by the Mitchell Institute, an organization founded by the Air Force Association. The report says the Air Force had 5,988 aircraft in 2009, lower than any year going back at least to 1950. However, security experts told Politifact that, as is the case with the Navy, the Air Force's advanced technologies more than make up for its smaller fleet. Mr. Obama did sign into law $350 billion in cuts to defense in the Budget Control Act over the summer -- and unless Congress acts to avert the "sequestration" cuts slated to go into effect in January, the Pentagon budget will be slashed by about another $600 billion. Mr. Obama said that "will not happen," but he hasn't said how he's going to stop that from happening. Romney said the military is shifting focus so that it will only be capable of fighting one conflict at a time. But when Mr. Obama and Defense Secretary Leon Panetta in January unveiled a new defense strategy for a smaller, more flexible military force, Panetta said just the opposite. "Confronting the threats of the 21st century demands greater flexibility to... shift forces," Panetta said, adding that "how we defeat the enemy may very well vary across conflicts." OBAMA: "We then organized the strongest coalition and the strongest sanctions against Iran in history, and it is crippling their economy. Their currency has dropped 80 percent. Their oil production has plunged to the lowest level since they were fighting a war with Iraq 20 years ago." Mr. Obama argued that the sanctions imposed on Iran have dealt significant setbacks to that country's economy, pointing to the precipitous devaluation of the Iranian currency, the rial, and Iran's diminished oil exports as evidence of the sanctions' bite. On both counts - currency deflation and reduced oil exports - the president was correct, and most analysts credit the sanctions levied by the international community at the urging of administration's urging as the primary culprit behind Iran's economic pain. Because the rial is not traded on international currency markets, an exact value is difficult to determine, but most credible estimates peg the deflation of the Iranian currency at 80 percent since the beginning of the year, a stunning drop that has highlighted significant anxiety within the Iranian regime. In early October, Iranian President Mahmoud Ahmadinejad delivered a televised speech calling on currency traders to stop selling the Iranian currency on the black market. A day later, authorities cracked down currency traders and suspected speculators. The moves sparked a large protest in Tehran that was supported by the commercially powerful Grand Bazaar, which was briefly closed and then reopened by the government. The protestors, according to Reuters, "[Blamed] the government for the collapse of the Iranian currency." The New York Times described the discord as "the first significant demonstration of anger over the devalued rial." The Times further cited "outside economic experts" who identify "the accumulating effects of the Western sanctions imposed on Iran over its disputed nuclear energy program" as a chief cause of the rial's devaluation. The sanctions also seem to be playing an operative role in Iran's faltering oil economy. An October report from the International Energy Agency revealed that Iranian oil production had plunged to its lowest level in 23 years, a drop that could only be attributed to the effectiveness of U.S. and E.U. sanctions. Iran produced just 2.63 million barrels of oil per day in September, down from 2.85 million barrels per day in August, and the lowest level in over two decades. In the last year, Iran's oil output has fallen more than 1 million barrels per day. The Financial Times argues that because "Crude oil is Iran's economic lifeline," the drop in oil output will injure "the country's economic stability." And it's not just oil production - due to the sanctions, Iran has also seen a sharp decline in profit from oil revenues as well. According to the Middle East channel on ForeignPolicy.com, "Expanded U.S. and EU trade sanctions have resulted in an estimate 45 percent decline in Iranian income from oil exports." In short, Mr. Obama has ample, credible ammunition to make the case that the sanctions he helped engineer are having a real, deleterious impact on Iran's economy. Whether they can eventually dissuade the Iranians from building a nuclear bomb remains to be seen. Romney: "When there were dissidents in the streets of Tehran, a Green Revolution, holding signs saying, is America with us, the president was silent. I think they noticed that as well." In 2009, Iranians took to the streets to protest the reelection of Iranian President Mahmoud Ahmadinejad - a dissident movement that was dubbed the "Green Revolution." Romney accused Mr. Obama of standing by, silent and idle, while the Ayatollahs and their security apparatus in Tehran efficiently and brutally routed the democratic protestors. Romney's accusation that the president was "silent" does not stand up to scrutiny. In fact, just three days after the first reports of unrest in Iran, Mr. Obama spoke out at a press conference, explaining, "When I see violence directed at peaceful protestors, when I see peaceful dissent being suppressed, wherever that takes place, it is of concern to me and it's of concern to the American people. That is not how governments should interact with their people....I stand strongly with the universal principle that people's voices should be heard and not suppressed." However, the president stopped short of expressing full solidarity with the Iranian protestors or explicitly supporting the reformist candidate in the disputed election, Mir Hossein Mousavi, explaining, "There are people who want to see greater openness and greater debate and want to see greater democracy. How that plays out over the next several days and several weeks is something ultimately for the Iranian people to decide." This cautious approach echoed the president's prior insistence that it is not America's role to dictate to the Iranian people their political future: "I want them to know that we in the United States do not want to make any decisions for the Iranians, but we do believe that the Iranian people and their voices should be heard and respected." It was this cautious approach that Romney attacked during the third debate, implying that, were he president, he would have voiced more full-throated support for the Green Revolution and the protestors demonstrating against the Iranian regime. Crucially, however, it is not at all clear that an American president siding with the democratic protestors in the Green Revolution would have strengthened the opposition to the Ahmadinejad government. In fact, the opposite might be true - the stamp of American approval on the Green Revolution may well have branded the movement as an American puppet, beholden to outside interests who are working to destabilize the Iranian regime. The leaders of the Green Revolution labored to portray their movement as a grassroots, organic force working to change Iranian society from within. Iranian Journalist Omid Memerian, writing for the Daily Beast, argued that open support from an American president would have dashed this painstaking stagecraft to bits. "For more than three decades, the Iranian regime has accused political dissidents of being American pawns as an excuse to suppress them," explained, Memerian. "If President Obama had publicly supported the pro-democracy protesters, he would have played right into the regime's hands. The movement would have lost its authenticity in the eyes of a wide range of supporters, irrespective of class, ethnicity, or political beliefs." OBAMA: "What we also have been able to do is position ourselves so we can start rebuilding America... Doing everything we can to control our own energy. We've cut our oil imports to the lowest level in two decades because we've developed oil and natural gas. " Oil imports can be measured in at least two ways - net imports (total imports minus exports) or as total imports. The U.S. Energy Information Administration (EIA) states, "[N]et-imports...gives a clearer indication of the fraction of oil consumed that could not have been supplied from domestic sources and is thus the most appropriate measure." John Cogan, spokesman for the EIA told CBS News in September, "If we look at net imports for the first seven months of 2012 it is 7,839,000 barrels per day and the last time we saw the figure at that level, on an annual rate of imports, was in 1993 when it was 7,618,000 barrels per day." ROMNEY: "The policies of the last four years have seen incomes in America decline every year for middle income families, now down $4,300 during your term. Twenty-three million Americans still struggling to find a good job. When you came to office, 32 million people on food stamps. Today, 47 million people on food stamps. When you came to office, just over $10 trillion in debt, now $16 trillion in debt. It hasn't worked. You said by now we'd be at 5.4 percent unemployment. We're 9 million jobs short of that." A May study by the Maryland-based research firm Sentier Research did find that real median American income in March was down by $4,300 since January 2009, when Mr. Obama took office. And while the technical number of unemployed persons stands at 12.1 million, it's true there are about 23 million Americans looking for more work -- that is, they're only employed part-time but would like to work full time, or they've stopped looking for work. In early 2009, there were 32 million people on food stamps, already an all-time record high. In July of this year, more than 46.6 million were on food stamps. The national debt was at $10.6 trillion when President Obama took office, reports CBS News' Mark Knoller, and in September it passed the $16 trillion mark for the first time in American history. Mr. Obama did not make the claim himself that he would lower unemployment to 5.4 percent. However, in a report issued in January 2009 -- right before Mr. Obama took office -- his economic advisers wrote that his proposed economic stimulus package could bring unemployment down to 5.4 percent by the third quarter of 2012. Without the stimulus, they predicted 6 percent unemployment. The White House has since said that the recession turned out to be far greater than economists realized at the time. Unemployment now stands at 7.8 percent.